This portrait of Alfred Spencer Heathcote is included in the Museum�s colonial exhibition. During the Indian Mutiny 1857 - 1859 Alfred Heathcote of the British 60th Regiment of Foot performed numerous acts of valour for which he was awarded the Victoria Cross. He also served in the final stages of the Second China War 1857 � 1860 and later gave military and civilian public service to Queensland and New South Wales. In 1871 he raised a troop of part-time cavalry in Queensland and was appointed later that year to be a captain of infantry in the newly-formed Permanent Military Forces of New South Wales. 1841. The 1841 Census for England shows that Alfred, then aged nine, resided with his family in Woodberry Down, Finsbury, London. 1855 - 1856. Alfred Heathcote was commissioned on 25 October 1855 as an ensign in the 1st Regiment of the Royal Surrey Militia.3 On 16 May 1856, he was commissioned as an ensign in the 60th Regiment of Foot,4 a British light infantry regiment consisting of three battalions. The 60th Foot was also known variously as the 60th Rifles or the King�s Royal Rifle Corps. 1857 � 1859. By June 1857 Alfred Heathcote was a member of the 1st Battalion of the 60th Regiment of Foot (1/60th) stationed at Meerut in northern India, about 70 km northeast of Delhi. Early the previous month, Indian troops of the British East India Company at Meerut mutinied and had withdrawn into the ancient walled city of Delhi which today is part of New Delhi, capital of India. Delhi came under a slow but eventually successful siege by British troops who assaulted and breached the city wall on 14th September 1857. For his part in operations extending over some four months, Alfred Spencer Heathcote was awarded the Victoria Cross. 1860. After transferring from the 1/60th to the 2nd Battalion of the 60th Foot (2/60th), Alfred Heathcote embarked at Calcutta, India on 28th February 1860 for action in the final stages of the Second China War 1857 � 1860. 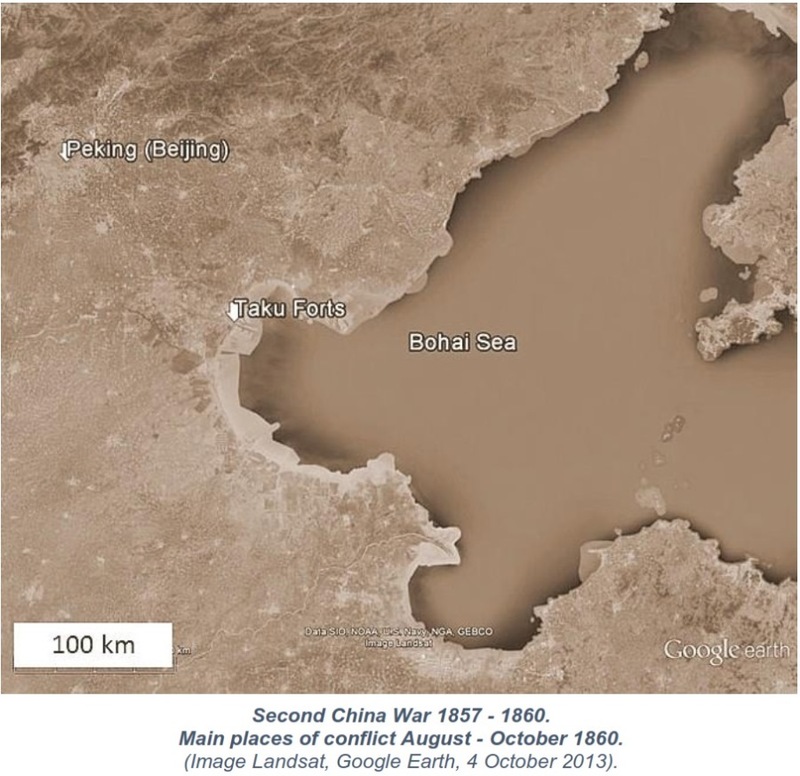 As part of an Anglo-French force, the 2/60th landed in north-eastern China in early August 1860 and was involved in the capture of Chinese defences known as the Taku Forts located by the estuary the Hai River. After the forts were captured, the Anglo-French force marched on Peking (Beijing, today�s capital of China) and occupied the city by midOctober. The occupation led to a peace treaty being signed on 24 October 1860. 1862 - 1863. Following garrison duties in China, the 2/60th landed in February 1862 at Portsmouth, Hampshire, about 120 km south-west of London. 1871 � 1872. On 1st August 1871 the Governor of New South Wales proclaimed the raising and embodying of a Permanent Military Forces battery of artillery to be known as the New South Wales Artillery and two companies of infantry to be known as the New South Wales Infantry. Close to each other, Tambaroora and Hill End are about 75 km north-west of the city of Bathurst in what at the time was a highly productive gold mining area. 1876 � 1912 Allred Heathcote was residing in Hill End in 1876, during which or soon afterwards he moved to Orange, NSW where he resided for some 17 years. He then relocated to Sydney then to Bowral in the New South Wales Southern Highlands. In August 1996 the Berrima District Historical and Family History Society had a plaque placed on Alfred Heathcote�s grave to mark the 125th anniversary of his appointment in the New South Wales Permanent Military Forces. The plaque was unveiled by Colonel Peter Martyn, President of the Army Museum Society, Victoria Barracks, Sydney. There is also a plaque in St James� Anglican Church, King Street, Sydney which commemorates Alfred Heathcote�s gallantry at the Siege of Delhi. Arranged by an unnamed person who served under him, the plaque also notes Alfred Heathcote�s raising and command of the first troop of volunteer cavalry in Queensland. 1. Wikipedia website - Alfred Spencer Heathcote. 2. Founded in 1382, Winchester College is one of the oldest schools in the United Kingdom. Lieutenant Colonel Daniel Burges, VC, DSO (First World War 1914 � 1918) (d. 1946). (Source: Wikipedia website � List of Old Wykhamists. 3. Recorded in The Gazette (Edinburgh Gazette), issue 6547, 23 November 1855. 4. Recorded in The Gazette (Edinburgh Gazette), issue 6598, 20 May 1856. 5. Combined Arms Center, U.S. Army website - The Nafziger Orders Of Battle Collection. 6. National Library of Australia � TROVE. (The Sydney Morning Herald, NSW, 26 February 1858, p. 3). 7. Recorded in The Gazette (London Gazette), issue 22347, 20 January, 1860. 8. Recorded in The Gazette (Edinburgh Gazette), issue 6817, 25 June 1858. 9. British India Office Ecclesiastical Returns- Marriages Image (Parish register transcripts from the Presidency of Bengal 1713-1948). 10. Recorded in The Gazette (Edinburgh Gazette) issue 7353, 14 August 1863. 11. National Library of Australia - TROVE. (The Sydney Morning Herald, NSW, 10 March 1864, p. 1). 12. National Library of Australia � TROVE. (The Brisbane Courier, QLD, 23 October 1866, p. 1). 13. Queensland Government Gazette, 1869, p. 252. 14. National Library of Australia � TROVE. (The Brisbane Courier, QLD, 27th February 1871, p. 2). 15. The poem was titled �The Warwick Irregulars� and appeared in The Examiner aTimes, Warwick, QLD on 29th April 1871. (p. 2). (National Library of Australia � TROVE). 16. National Library of Australia � TROVE. (The Sydney Morning Herald, NSW, 9th August 1871, p. 6). 18. National Library of Australia � TROVE. (The Sydney Mail, NSW, 7th June 1873, p. 732). 19. National Library of Australia � TROVE. (The Sydney Mail and New South Wales Advertiser, NSW, 17th April 1875, p. 493). 20. National Library of Australia � TROVE. (The Muswellbrook Chronicle, NSW, 13th March 1912, p. 4). 21. National Library of Australia � TROVE. (The Sydney Morning Herald, NSW on 12th July 1916, p. 10).